Premium features like bandwidth prioritizing and beamshaping allow you to decide where your bandwidth is needed most. Nobody likes lag while gaming, or glitches and buffering while streaming video. 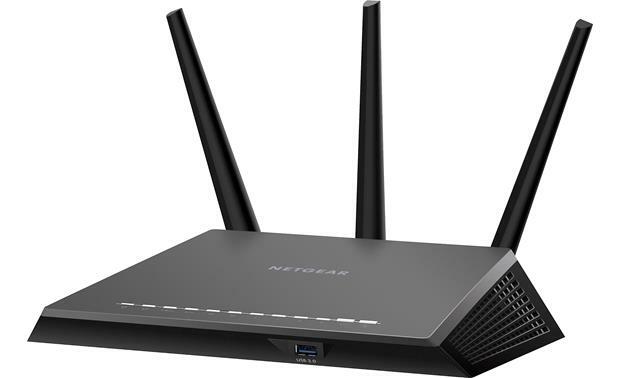 The NETGEAR R7000P/AC2300 Nighthawk makes sure all of your wireless devices get enough bandwidth, and it's packed with features that enhance the online experience for serious gamers. A powerful 1GHz dual core processor is the brains of the operation, and premium features like bandwidth prioritizing and beamshaping allow you to decide where your bandwidth is needed most. The gamer in your house will love that, but it also offers flexibility for streaming video on movie night, listening to high-res music, or downloading large work files. 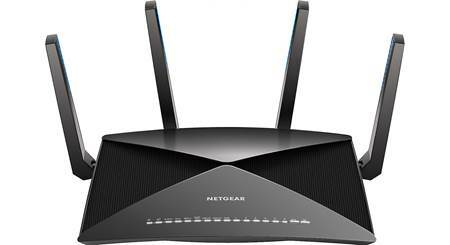 The NETGEAR AC2300 Nighthawk offers impressive wireless range, and plenty of fast wired connections. This Nighthawk is compatible with Amazon Echo (Alexa) voice control, so you can navigate and control your network with the greatest of ease. If you don't have Alexa in your home yet, don't worry, you can take care of business quickly with NETGEAR's genie® app, too. If you plug your USB hard drive into your Nighthawk Wi-Fi router, you'll open up the door to NETGEAR ReadyCLOUD® USB Access. That means wherever you are, you'll be able to access your connected USB storage device, so you can keep large files like photos and videos at home, then see and share them when you're out and about without taking up precious space on your mobile device. The router can also perform regularly scheduled backups to the connected drive, so your important data stays current and safe. NETGEAR's Wi-Fi Protected Access® offers tough WPA/WPA2 encryption that denies outsiders access to your wireless signal. 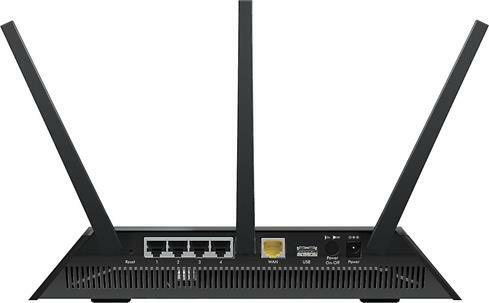 This router also offers double firewall protection and a stiff defense against denial-of-service (DoS) attacks. If you have young ones in the house, use the router's parental controls to filter out content you don't want them to see. If you're one of the growing number of people who occasionally works from home, the Nighthawk offers a strong, secure VPN connection as well. NETGEAR routers are designed for easy installation. Once you've plugged in a few cables, use the single-button Push ‘N' Connect function to connect your Wi-Fi quickly. The NETGEAR genie app lets you monitor, control and troubleshoot your network from a convenient personal dashboard. Good product. Works well. FAST! AC2300 Smart WiFi Router: Built with gaming, streaming and mobile devices in mind, this next generation gigabit WiFi router has a 1GHz dual core processor and delivers extreme speed so you enjoy less lag and less buffering. With Dynamic QoS, Beamforming+, MU-MIMO. and built-in high powered amplifiers and external antennas, you get WiFi coverage anywhere around your home. 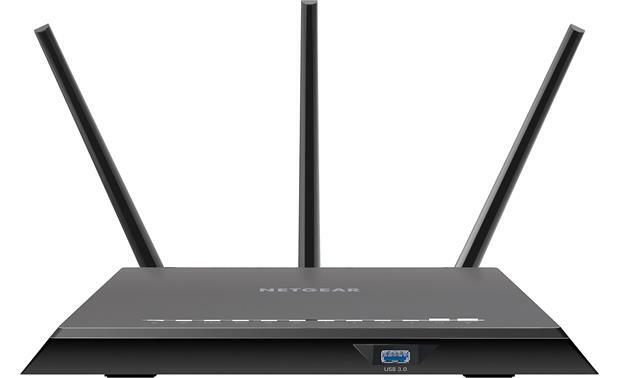 Variety of Applications: With NETGEAR's Nighthawk AC2300 Smart WiFi Router, you can create a powerful home network for applications such as lag-free multiple HD streaming, multi-player online gaming, ultra-fast, reliable connection to the Internet and a secure wireless connection. Surf/Chat/Email: Enjoy a reliable, secure wireless connection to the Internet for surfing the web, chatting, and email. HD Video Streaming: Optimized for a smooth, lag-free HD video streaming experience; even for multiple devices. Internet Radio Music: Enjoy a fast and reliable wireless connection for listening to music online. Online Gaming: Optimized for multi-player gaming with no lags. 1GHz Dual-Core Processor: The NETGEAR Nighthawk's Dual Core 1GHz processor boosts wireless, wired, & WAN-to-LAN performance. The NETGEAR Nighthawk AC2300 Smart WiFi Router is built to handle all your high-bandwidth online activities with features that will keep you connected at top speeds. 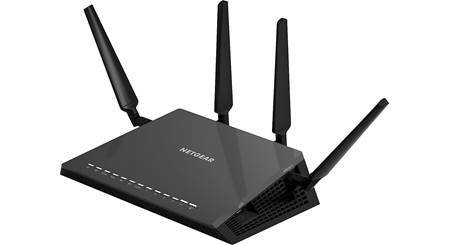 WiFi Technology: The NETGEAR Nighthawk AC2300 Smart WiFi Router offers Gigabit WiFi speeds thanks to its WiFi 802.11ac chipset, plus extended WiFi range and reliability due to its 2.4GHZ & 5GHZ dual-bands. Gigabit WiFi Speed: The NETGEAR Nighthawk AC2300 Smart WiFi Router adopts the latest WiFi 802.11ac chipset for extreme download speeds up to 600+1625 Mbps (up to 600Mbps @ 2.4 GHz, 1625Mbps @ 5 GHz). It is also backward compatible with 802.11 a/b/g/n devices. Next generation 802.11ac WiFi with dual band technology avoids wireless interference and provides whole home coverage ensuring top WiFi speeds and reliable connections. Everything you need for an ultra-fast WiFi connected home. 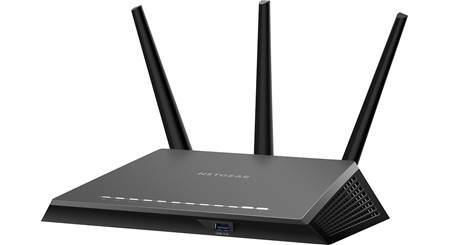 Extended WiFi Range: The NETGEAR Nighthawk AC2300 Smart WiFi Router is equipped with high-powered amplifiers and three external antennas that provide extremely reliable WiFi connectivity throughout larger homes for all your Internet-enabled devices. Dual-Band WiFi: Simultaneous dual band WiFi provides two separate WiFi networks - 2.4GHz for legacy devices and 5GHz which is less interference-prone for media streaming. Gigabit Wired: The NETGEAR Nighthawk AC2300 Smart WiFi Router is fitted with five 10/100/1000 (1 WAN & 4 LAN) Gigabit Ethernet ports with auto-sensing technology. The WAN port is used to connect your Internet modem, while the LAN ports are used to connect your local network devices. Advanced Technologies: With features like Dynamic QoS, Beamforming+, and MU-MIMO you get enhanced speed by up to 100%, so you can roam freely throughout your home without fear of slow or dropped connections. Dynamic QoS: Dynamic QoS resolves Internet traffic congestion when you have competing Internet demands at home. Dynamic QoS identifies your online activities by application and device, and then utilizes bandwidth allocation, and traffic prioritization techniques, to automatically allocate more bandwidth to latency sensitive applications like online gaming and video streaming, while ensuring that lower priority applications continue to work. Multi-User MIMO (MU-MIMO): Using Multi-User MIMO technology, this NETGEAR router can stream data to multiple devices simultaneously. With MU-MIMO, your WiFi network can deliver faster throughput to every MU-MIMO connected device. That means faster downloads and smoother streaming for your devices. Convenient Content Sharing: With NETGEAR, sharing across your network is built-in and simple, anything from accessing stored photos & music to wireless printing. DLNA: Stream your stored media files anywhere on the network to DLNA screens. AirPlay Compatible: Share your music to Airplay-compatible devices from the USB hard-drive connected to the router. ReadySHARE USB Access: Wirelessly access & share USB hard drives via the router's dual USB ports (2.0/3.0). USB 3.0 is 10x faster than USB 2.0. ReadySHARE Printer: Wirelessly access & share a USB printer. Simple Setup: NETGEAR makes installation and management fast & simple, so you can connect quickly & make sure you stay that way. The router offers a built-in Setup Wizard for computer setup, an Apple & Google Play app for Apple iOS & Android setup, plus a WPS push-button setup. Device Install: Easy setup for iPad, tablets, smartphones & computers. NETGEAR Genie App: Personal dashboard to monitor, control & repair your home network from your smartphone or tablet. WiFi Power On/Off: Convenient power savings. High Security: Maintain the highest security across your network to ensure your privacy & family is safe while online. Whether it's preventing phishing & spyware or just limiting access for kids & guests, NETGEAR has you covered. VPN Support: VPN support offers secure remote access for telecommuters. Guest Network Access: Separate & secure access for guests. Guest networks create a completely separate WiFi network for your guests' devices, ensuring they do not have access to your home network or to the shared USB hard drive with all your personal data. Secure WiFi Connections: Secure WiFi connections offer the highest level of WPA/WPA2/WPA2-PSK security with Double firewall protection (SPI/NAT firewall) and Denial-of-Service (DoS) attack prevention. Personal FTP Server: With your customized free URL, you can use FTP to access your network when you aren't home through Dynamic DNS. Firmware/Software Updates: Its USB 2.0/3.0 ports and 128MB Flash/128MB memory provide future software feature expansion. Click here for the latest firmware/software updates from NETGEAR. LEDs: LEDs on the top-panel of the Nighthawk AC2300 indicate router status. Operating Systems: Microsoft Windows 10/ 8 / 7 / Vista / XP /2000, Mac OS, UNIX, or Linux. NETGEAR Genie App: For advanced configuration and management, the NETGEAR Genie App for Apple iOS 7.0+ (iPod touch/iPhone)/Apple iOS 7.0+ (iPhone) , Android OS 2.3+, Windows PC (Vista-up) and Mac (OS 10.6-up) may be used. The NETGEAR Genie App makes getting the most out of your home network fun & easy. The Genie App lets you easily monitor, connect & control your home network from a Windows PC, Mac computer/laptop, Apple iOS device, or Android smartphone/tablet. With the NETGEAR Genie App you can share & stream music or videos, diagnose & repair network issues, set up parental controls & more. Before you enable your NETGEAR router to work with Alexa, you must download the NETGEAR genie app, create a remote access account, and register your router with your remote access account. There are two ways to enable your NETGEAR router to work with Amazon Alexa. You can use the command "Alexa, enable the NETGEAR skill," or you can manually link the NETGEAR skill to your Alexa app. NETGEAR UP App: The NETGEAR Up App for Apple iOS 8.0+ & Android OS 4.2+ makes it easy and intuitive to setup and use the NETGEAR Nighthawk X10 router. With the NETGEAR UP app, you can install your router using very few steps - just connect your mobile device to the default network, and the app will walk you through the rest. The app automatically updates the router to the latest firmware, allows you to personalize your WiFi network, and even help register your router with NETGEAR. At the end of installation, an easy to use overview screen provides quick way to see what your network credentials are so you don't have to write it down on a piece of paper. The overview screen also shows you all connected devices and links you to helpful support information related to your router. Notes: You can still use web-based installation wizard to install the router by visiting www.routerlogin.net from your mobile device or a PC connected to the router. NETGEAR ReadyCLOUD: Thanks to NETGEAR's ReadyCLOUD app, you get to enjoy personal and secure cloud access to USB storage devices connected to the Nighthawk X10 Smart WiFi Router anytime, anywhere from your Apple iOS 8.0+ device, Android OS 4.0+ smartphone/tablet, or a web portal on your Windows or Mac computer. Backup Apps: Keep your content safe by using NETGEAR's ReadySHARE Vault application for backing up Windows-based PCs. For Mac OS users, back-up using Apple Time Machine. ReadySHARE Vault (for Windows PC): NETGEAR ReadySHARE Vault is a free software for automatic Windows PC backup to a USB hard drive connected to the router. You can schedule automatic hassle-free backups to safeguard precious photos and files from any PC directly to the connected USB storage. Time Machine (for Mac): You can use Time Machine to back up your Mac computers onto a USB hard disk drive that is connected to one of the router's USB ports. Kwilt: Use the Kwilt app to view your photos saved on your external USB hard drive (HDD) that is connected to your Nighthawk router on your Apple iOS 9.0+ device or Android OS 4.2 smartphone/tablet. 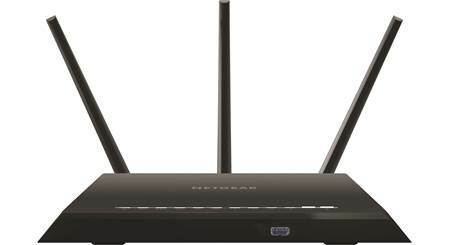 Searches related to the NETGEAR AC2300 Nighthawk™ Dual-band Wi-Fi® router (R7000P).